Open Houses This Sunday August 25th from 2-4pm! Join our team of Realtors in Louisville KY this Sunday August 25th from 2-4pm at two spectacular Open Houses! 2903 Weissinger Rd is a lovely 3 Bedroom Ranch in Langdon Place. The house offers over 2900 square feet of living space and a great back yard! The home has had numerous updates including new carpet in the Living Room and Basment in July 2013! Directions to 2903 Weissinger Rd: Goose Creek to Langdon Drive. Right on Street. 5022 Oakbrook Dr is a beautiful 3 Bedroom Cape Cod in Oakhurst. The home has over 1900 square feet of living space and neutral decor. You'll love the stone fire place and fenced in yard! 133 Inglenook Drive Taylorsville Ky 40071 is a stunning 4 Bedroom brick ranch nestled on a quiet street in Earlywyne Plantation. The home features an open floor plan and numerous upgrades throughout including custom trim work, hardwood flooring, and dramatic 10 foot ceilings. A handsome front foyer greets guests and leads to the wonderful Great Room with decorative transom windows in both entryways, tray ceiling, and fire place with marble surround. Two windows in the Great Room overlook the freshly stained back deck. The Formal Dining Room is perfect for holiday gatherings or dinner entertaining and showcases a 14 foot ceiling with crown molding, several large windows for naturalight light, and a chandelier fixture.The home has a beautiful Kitchen with plentiful cabinet space, breakfast bar, and stainless appliances. A large kitchen dining area overlooks the back yard. The property offers a split floor plan which provides privacy to each bedroom area. The Master Suite is highlighted by vaulted ceiling and a luxurious spa-like Master Bath with jacuzzi tub and walk in shower. The two first floor secondary bedrooms are spacious and convenient to a Full Bath and Laundry Room. The huge walk-out basement is fully finished. The Basement Family Room contains a floor to ceiling stone fire place and connects to a Reacreation Room. Another Bedroom, Full Bath, and Den complete the basement. 133 Inglenook Drive Taylorsville Ky 40071 is immaculate with a private back yard that backs up to a wooded area and a two tiered back deck. The Earlywyne Plantation subdivision sits just five minutes from downtown Taylorsville (with numerous shopping and dining options) and only twenty minutes from Louisville! The neighborhood is still growing with new homes going up on several lots and some lots still available. Earlywyne Plantation is also just minutes away from Taylorsville Lake State Park- a nature lovers dream! Taylorsville Lake State Park offers over 1200 acres of gorgeous land with boating, fishing, hiking, camping, and equestrian trails! What a spectacular place to call home! 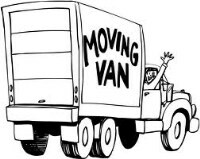 Whether you're moving across town or across the country, moving is a life changing experience. All of the packing, financial planning, and quiet conversations between family members finally come to rest and a new chapter of life begins. Shortly after joining At Home In Louisville Real Estate Group, my husband and I traveled with our daughter and her family to assist with their move to Texas. As the big yellow moving truck pulled away from our house, our daughter and her family began their journey to Texas with a little help from Mom and Dad. As the 1,000 mile drive began from Louisville to Kerrville, Texas my husband drove the big yellow truck and pulled an extra vehicle while my daughter and her family followed behind in their car. The journey itself was fairly uneventful (considering we were traveling with a two year old and five week old infant) minus the pit stops for diaper changing, nursing, gas, occasional emergency and of course food. Our first night we stopped in Arkadelphia, AR and we were able to park the big yellow truck in a safe place underneath some great lighting, so no worrying there. Our two year grandson slept in our room so we had to go to bed at 8:30 p.m.! Day two began and was again uneventful with good weather and mild traffic. We arrived at their townhouse around 8:00 p.m. and it was 107 degrees!! No thank you not my kind of weather. Anyway, we went to unload the truck only to realize there was no way all of their items would fit into the little townhouse. So, we went to bed, got up in the morning and started looking for another house to rent (luckily their lease was almost up and they hadn’t renewed yet) and guess what? We found one! -A beautiful house I might add. We started unloading the truck, now the complication comes in because my son-in-law had been living in the town house, so we had to pack up the townhouse load the truck and then unload it again at the new beautiful house…did I mention it was 107 degrees and we had a two year old and brand new baby with us? Imagine the scenario. After a few days my husband and I got them settled in Texas and had to fly back to Louisville to an empty house. No toys to step on, no food on the floor under the table, no bottles in the sink to wash, no laundry piled up , no crying babies and no laughter. Our hearts were broken. We are hoping to get a call for Mom and Dad to come help them move again soon and that this time the big yellow truck will be moving them closer to home. For information about moving to Louisville or homes currently for sale in the Louisville Real Estate market, please contact us today. Being a Realtor is one of my favorite things that I do. A close runner up is being involved in my Louisville community, volunteering to make a difference, and meeting great new people. Not long ago, I found a great organization that helps me do all three: The Junior League of Louisville, founded in 1921. The Junior League of Louisville (JLL) is a part of a nationwide League that was founded in 1901, The Association of Junior Leagues International. So, what is the JLL? Our mission statement states “The Junior League of Louisville, Inc. is an organization of women committed to promoting voluntarism, to developing the potential of women, and to improving the community through the effective action and leadership of trained volunteers. Its purpose is exclusively educational and charitable. “ This is a group of ambitious women ready to serve our community. In the last year that I have been involved, I have had the privilege of volunteering at the Family Scholar House helping to teach single mothers to cook healthy meals, Blessings in a Backpack meeting children who touched my heart, and Keep In Touch where I was able to help women check in to get a mammogram. These are just a small portion of the charities that the JLL is involved in. We also are available to help non profit organizations find volunteer members for temporary events. The JLL also takes care of their own members by offering free monthly classes to train and educate us. We take this training and go out into Louisville to make our community a better place. In the 1940s, the JLL helped create the Children’s Theater. And more recently, the JLL had a big hand in helping create the Waterfront Park. These are just a few of the great things that we have done. The Junior League of Louisville is an amazing organization and I am proud to be a part of it. But we can’t help all of these charities without the great generosity of Louisville citizens. Two of our biggest fundraisers are our HollyDays 3-day, buy local shopping extravaganza in November, and selling our deliciously amazing cookbooks including our newest cookbook, Bluegrass Gatherings. I am an active member who sits on the Marketing and Public Relations committee for the JLL this year. If you have any questions about the League or donating, please email me at Katelyn@AtHomeInLouisville.com. Contact At Home In Louisville Real Estate Group for additional information about organizations in Louisville and Louisville Real Estate. First Time Homebuyers- Where to start? First Time Homebuyers-Where to start? 1. Choose a Realtor who knows what they are doing- I recommend a buyer consultation. Buying a home is the most expensive purchase in most of our lives. As a result, there is more at stake. Choosing a licensed Realtor or real estate team can make all the difference. Interview your candidates and make sure they know what they are doing and can help you purchase with the highest amount of advantage possible. Not all licensed Realtors have the experience or skill set required to protect you and your family throughout the process. Ask them if they offer a free buyer consultation to discuss your goals before you ever venture out into the market and start looking at potential homes. An organized and efficient process should be the result of choosing a quality real estate professional. A “Pro” will guide you every step of the way. A common mistake for first time homebuyers is looking at houses before they have spoken to a lender. And it can be a painful one. Discussing your credit profile and the initial and monthly investment required to buy a home can spare you the bad feeling of finding a house you love but not being able to buy it. Reviewing your credit with a quality lender can verify that what you think you look like on paper is accurate before you enter into a contract with a seller. Also, discussing down payment and total monthly payment can help to determine what price range for a home is comfortable for the budget. What you qualify for and what is comfortable per month are often different things. Don’t be house poor! Often, when we consider buying a home we immediately think of what we would like the house to have. What we want. Lots of space, a pool, gourmet kitchen, etc. But that is often not what we need. I recommend making a list of the features that your life requires. Things that fit what you do and your family structure. For example, if you have a 150 pound dog then a large yard could be a priority. Or if you are a car lover then perhaps a garage would be required. If you make a firm list of the “must haves” then it is easier to focus the search and only look at those houses that actually meet your needs. Then it is simply a matter of choosing which of the homes that meet your needs do you like the best. The better you understand what you need in a home the easier it will be to find. So you purchased your first home. That’s great! Now begins the task of owning and caring for it. Most first time home buyers don’t realize what owning a home truly requires. A house requires constant care and maintenance. This is not meant to cause fear in buying but to clarify that now you, as the homeowner, are required to keep the house in the best physical and mechanical shape possible to protect the investment you have decided to make in purchasing real property. When calculating what you need to purchase a home I recommend that you also build in 3-6 months of surplus funds in case something happens that requires a major fix to the home. Hopefully you chose to have the home inspected and it had a clean bill of health. But when a house transfers ownership there is often something that comes up in the first year. It is not uncommon. People live differently and when a routine is changed a house can reflect it. So be prepared. Your Realtor should also recommend a home warranty as added protection. From the first step of financial qualification to the last step of receiving the keys, buying a home is a process. A quality Realtor will keep you informed and on track. They should help you focus on the current step while they focus on the big picture. Knowing the process and where you are in it will help to minimize the anxiety that can come with such a major purchase. The Realtor you choose should be capable of handling the bumps that will come, as they do in any home purchase. Getting you from the start to the finish is their job. Be sure the person or team you choose to get you there has the ability to do so. Then trust them to guide you. Buying your own home is one of the most exciting things that can happen in your lifetime. The realization of the “American Dream” is a truly wonderful experience. But be smart in the start to insure you have a happy finish. For additional questions about buying your first home in Louisville, contact one of our Realtors in Louisville Ky today. 4615 Wolfspring Drive Louisville KY 40241 is a fantastic 4 Bedroom Brick home in the desirable Wolfcreek community of Louisville's East End. The subdivision offers a neighborhood tennis court, club house, & pool and sits right next to sought after Norton Elementary School! The front entrance of the home opens to an attractive foyer with hardwood flooring. Sparkling hardwood floors flow throughout most of the first level. The handsome Formal Dining Room displays crown molding and tray ceiling. The cook in your family will adore entertaining in the large kitchen with granite counters, recessed lighting, tile back splash, kitchen island, and built in desk! The Kitchen dining area is pleasant and warm with loads of natural light and a great view of the back yard. 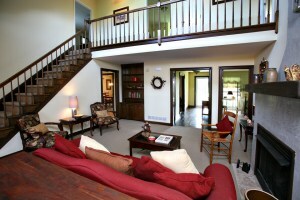 The Living Room is accented by crown molding and connects to a Family Room with floor to ceiling brick fireplace. The Master Bedroom has a tray ceiling, walk in closet, Master Bath, and spacious Sitting Room. The lovely Master Bath includes a jacuzzi tub and double vanity. The Sitting Room is large enough to serve as an excercise room or office space! Three other Bedrooms are positioned on the second floor along with a Full Bath with skylight. 4615 Wolfspring Drive Louisville KY 40241 has a finished Basement that includes another Full Bath, office, and Family Room. There is a 2 car garage and a peaceful back yard with a covered deck area. Extraordinary location and meticulously maintained! Call today to set up your private showing of this beautiful home and one of our Louisville Real Estate agents will be glad to assist you. Join our team this Sunday from 2-4 at 133 Inglenook Drive in Taylorsville! You will absolutely love this Beautiful 4 Bedroom Brick Ranch with Open Floor Plan! 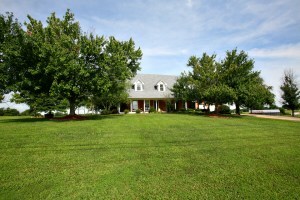 The home has over 4300 square feet of Living Space and is located in spectacular Earlywyne Plantation! 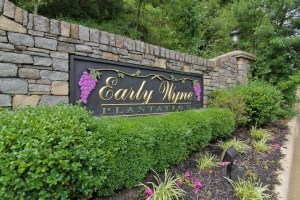 Earlywyne Plantation is a quiet neighborhood in the heart of Taylorsville. The property sits only minutes away from Taylorsville Lake State Park and just twenty minutes away from the Gene Snyder! For additional information about this property or other Open Houses in Louisville KY contact a member of At Home In Louisville Real Estate Group today! Private mortgage insurance, or as many lenders call it PMI, is a an insurance policy that a buyer must obtain to be offered a risk based loan. This insurance policy is put into place to protect the lender should the borrower default on the loan. If a buyer defaults on a home loan, the insurance company will reimburse the lender for associated losses. 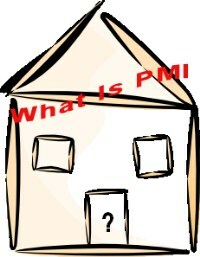 Conventional Loans: On Conventional loans, PMI is required unless a buyer puts down at least a 20% down payment. There are some loan programs that will allow you to put down less than 20% without obtaining PMI but typically, the lender will attempt to cover the loan risk by increasing the rates or closing costs in the loan. Sometimes these increases can be a more costly option over the life of the loan. So, do your homework when comparing loan options and ask lots of questions. FHA Loans: FHA loans generally require the buyer to pay Mortgage Insurance for the entire life of the loan. However, if the buyer is able to put 10% or more down, Mortgage Insurance will be required for only 11 years of the loan. Regardless of down payment amount, mortgage insurance is required for at least 11 years with an FHA loan. This is the major difference in PMI between FHA and Conventional loan. If you are trying to avoid mortgage insurance, discuss with your loan officer the options of a USDA loan or a VA loan if you are a veteran. Also, keep in mind while making a decision that Mortgage Insurance is a tax deductible cost. Review all options and work with your loan officer on the best option for you and your family. Should you have any additional questions about the lending process in Louisville, KY, we invite you to contact one of our preferred lenders Jason Justice with First Commonwealth Mortgage or contact a member of At Home In Louisville Real Estate Group today. 1499 Stringer Ln Mt Washington KY 40047 sits on over 3 acres of rolling land. The exterior of the home features a huge landscaped front lawn, fantastic wrap around porch, and stunning back yard complete with brick and concrete patio and in ground swimming pool! The front porch opens to a lovely foyer with dark hardwood flooring. The Family Room is two stories and showcases a fireplace with ventless gas logs, exposed wood beam ceiling, and built in bookshelf. 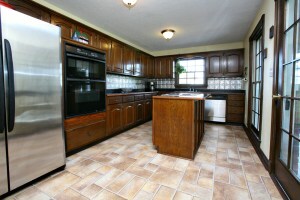 The Kitchen is perfect for entertaining with a center island, modern appliances, tiled floor, and nice dining area. A pleasant Living Room is open to the Formal Dining Room. The home offers a convenient first floor Master Bedroom with a luxurious Master Bath including a walk in shower, tiled jacuzzi tub, double vanity, and bay window. A sizeable Den completes the first floor. Two large Bedrooms with window seats and a Full Bath are located on the second floor. The Basement is finished to include a Laundry Room, Full Bath, and Family Room. The home also offers a 2 1/2 car detached garage that is connected to the main home by a breezeway. 1499 Stringer Ln Mt Washington KY 40047 has had a number recent updates including a new pool liner (2013), Furnace (2011), AC (2013), updated fixtures and flooring in the bathrooms, and several replacement windows (2013). The property is a fantastic purchase and includes the house and primary lot as well as two adjoining lots. Call today to set up your private showing or to inquire further about homes for sale in mt washington ky.
Join our team of Realtors in Louisville KY this Sunday August 11th from 2-4pm at 4615 Wolfspring Drive! 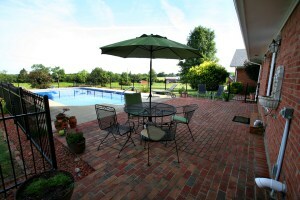 You'll love this 4 Bedroom 4 Bathroom brick home in Wolfcreek. Beautiful interior and fastastic yard in the ideal location!